Leek gratin is traditionally made with Reblochon, a pungent cheese from the French Alps, but it has been snowing in Paris. The snow brought the city to a standstill, and by the time it stopped the stores were empty. No Reblochon to be found! I wanted to make this recipe, so I improvised with raclette, a similar cheese. Tantalizing waves of aroma spread through the house as the leeks baked. This is winter comfort food at its best. For someone who has spent winters in Wisconsin, upstate New York and Moscow, the idea of a few inches of snow paralyzing a city is laughable. But few were laughing last week as the snow iced over and Parisians with broken bones poured into hospital emergency rooms. Bus service halted, taxi drivers went home, schools closed. The kids were in the streets tossing snowballs at passers-by. I ventured out among them, trodding carefully over the ice and dodging snowballs as I made my way to the local supermarket. This is what I found. 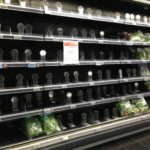 At the front of the store, the salad shelves were empty, a sign announcing that due to the weather, delivery trucks had been unable to get through. This was two days after the snow stopped. The dairy shelves, usually packed with a thousand types of yogurt, were empty too. In the cheese department, after hunting in vain for Reblochon, I found a lone packet of raclette and snatched it up. I already had the leeks. It was time to start cooking. The beauty of leek gratin, beyond its delightful flavor, is that it’s so easy to make. You chop the leeks, steam or parboil them, drizzle on a little cream, add the cheese and pop them in the oven. Thirty minutes later, the gratin is ready to serve. This dish has enough character to stand on its own, perhaps with a salad or some cured ham alongside. It marries well with roast meat or chicken, and deserves a hearty red. It’s a crowd pleaser — you may have to double the recipe. So when it starts to snow, head immediately to the store to stock up on leeks and cheese (many other cheeses work well, as explained in the recipe). While the gratin is baking, if you’re lucky enough to have a fireplace, pile on the wood and light a match. Then watch the flakes drift down for a quiet moment. It will soon be time to eat. This entry was posted in 8. 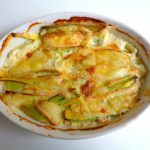 Vegetables and tagged gratin, leeks, reblochon, recette, recipe. Bookmark the permalink.